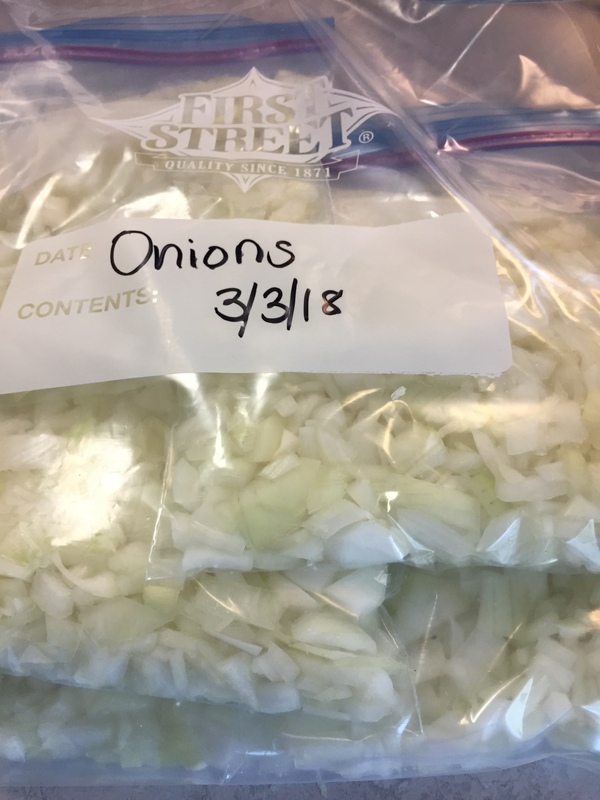 Today, we were able to add onions to our freezer, and to our bucket where we keep fresh onions. The easiest way to preserve onions is to dry them and keep them in a cool, dry place, so that’s what we do. I was down to 3 onions from the 25 lbs Rob picked up a few months ago, so I was delighted when he, again, brought home the….onions! We were shopping after church for some food we needed for the week ahead, and he went out to put the groceries in the car while I redeemed some Safeway Monopoly coupons. (Amazingly, we actually won $5!!!). A total stranger approached him in the parking lot and confided that he had bought a huge bag of onions, and had already taken out the ones he wanted. Some were going soft, he said, but there were lots of good ones. Did Rob want them? You bet! He happily accepted them. There had to be 15 pounds or more still left in that bag! Later, once home, he sorted them. All of the best ones, he put in the bucket we keep onions in. We store them in the garage, where it is much cooler than the rest of the house. Even so, at this time of year, they want to sprout and grow, so I have to keep an eye on them. A few he threw directly into the garden, where he will till them in for compost when it dries out because they were over the hill. There was a sizable pile left that were starting to “go.” He peeled them, and trimmed away all the soft/brown/bad spots. He then chopped all the good parts and pieces into small chunks and we put them in quart-sized ziplock bags. We did not over-fill the bags so each bag ended up as a flat, thin layer, and we laid all the bags out flat inside of a super large bag. There are 5 or 6 small bags in the big one. We did this so that they won’t get lost in the freezer and so that a piece of the desired size can be easily broken off of the frozen chunk for quick meal prep. Then they were popped into the chest freezer in the shop, and they will freeze flat. I will use the fresh ones as much as possible, and then freeze more of those if they start going bad quickly. When I’m in a hurry, or run out of fresh ones, I now have frozen ones to use in a pinch. What a totally unexpected blessing! I mean…we don’t even know the man that gave Rob the onions. I’m amazed at how God is providing for us this month. We are very thankful! Becky, what a wonderful gift and from a stranger, too! I, too, keep cut onions in the freezer! Often, when I cook, I only need half an onion. I will slice or dice the rest of the onion and freeze that in a snack size zipper bag; the next time I go to cook, I have the onions already cut and ready! I use snack size zip-locks all the time. Perfect size for 1/2 cup of diced onion or peppers. I just did a few last night. I buy mine at WalMart as that’s the best price for me. Snack size would be great! But, since I don’t have any of those, I just smashed the chopped onion into a thin, flat layer, and will break off chunks as needed. But, I can sure see the advantage in the snack size, and might pick some up! God is so good. Thank you for sharing your wonderful blessing. I was encouraged by it, even though it may seem small to some. Not small! I love the way God watches out for us with little gifts like that. He is so good! I wish he could know how much we appreciated those onions. What a sweet thing for that stranger to do! Have you ever dehydrated some of your excess onions? Although I do keep some freshly chopped and frozen onions in the freezer, I actually prefer to dehydrate them because they take up so little space and are easy to add to soups, stews, etc.. I would have been thrilled with that gift. What a nice man to have given his extras to your hubby. It was nice, and so totally unexpected:). You would appreciate this….today, I was able to pick 3 green onions in my garden that were self seeded last summer! So nice the snow departed!!!! !